One of the the best ways to appreciate the work of the Nature Conservancy of Canada (NCC) is to visit some of our spectacular properties. NCC's Manitoba Region encourages you to reunite with the things that bring you joy in life. And we know just the places for you to do this. Located in the heart of the Manitoba Tall Grass Prairie Preserve, NCC's The Weston Family Tallgrass Interpretive Centre (a redesigned 3,000-square-foot home) is located on a 160-acre (65-hectare) site showcasing the beauty and diversity of the rare ecosystem around it. The centre includes interactive displays and exhibits, a 400-square-foot prairie mural, a meeting space and an observation deck on the second floor. 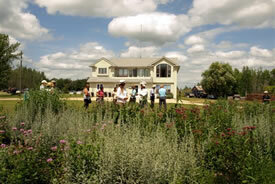 The surrounding grounds feature a prairie garden, picnic shelter and the Prairie Orchid hiking trail. Located 100 kilometres southeast of Winnipeg, near the community of Stuartburn, the centre is open year round for school, youth and community group programming and is also available for rental for private events and meetings. Visitors can enjoy presentations and tour one of the most endangered ecosystems in North America: the tall grass prairie. Located next to The Weston Tallgrass Prairie Interpretive Centre, the Agassiz Interpretive Trail is an incredible example of the tall grass prairie ecosystem. It is the meeting place for many diverse communities of wildlife and plants. Visitors to this endangered habitat will leave with a true sense of why this ecosystem is worth protecting and how NCC is working hard to secure these precious lands for our children and grandchildren. the longer, 3.2-kilometre trail takes you around the 320-acre (130-hectare) site. the shorter loop, almost two kilometres, weaves through 160 acres (65 hectares). The trail features several rest stops, two picnic areas (one at the trailhead and one at the halfway point) and washrooms at the trailhead. The trailhead and parking area are situated on the east side of the property. The trail has been groomed to enable people of all ages, including researchers and school-age children whose studies include Manitoba's natural history, to walk among 500 species of plants and animals, including rare and endangered species that are found within their natural habitat. In order to reach the Agassiz Interpretive Trail from highway #59, travel 11.5 kilometres (seven miles) east on highway #201, and watch for the trail signs. Just a stone's throw from the heart of the city of Winnipeg, at the junction of the Red and Assiniboine rivers, lies NCC's The Forks Prairie Garden project. 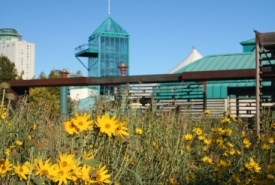 In 1999, NCC partnered with the Forks Renewal Corporation and others to establish a demonstration garden that featured Manitoba's natural heritage, in anticipation of it being a showcase for visitors at the Pan Am Games. The project became so significant in its impact that it became a permanent feature at The Forks. Now, over 15 years later, the 20,000-square-foot garden features various native tall grass prairie grasses and wildflowers, providing visitors with a glimpse into Manitoba's natural history. This project has become NCC's most frequently visited project in Manitoba, with an estimated four million visitors passing through each year. Only a low stone wall separates beds of bergamot, gaillardia and harebell from the steady flow of passing motorists, pedestrians and cyclists. Along one side of the carefully tended plots of native wildflowers and grasses, diners satisfy their appetites on lush salads, burgers and fresh pasta. The scene is a far cry from the wilderness that once covered this bustling downtown crossroads. Centuries before the city arose on the riverbanks, The Forks was a meeting place for Indigenous peoples. Further upgrades to the site will continue with interpretive signs and a larger gathering area in the plan, pending funding. In the meantime, make sure to check out The Forks Prairie Garden throughout the seasons to experience how the garden changes. While you’re there make sure to take a picture and tag NCC in it throughout your social media (@NCC_CNC). We would love to see you enjoying the space! NCC would like to extend our gratitude to The Winnipeg Foundation for their generous support. The Forks Prairie Garden, supported by NCC and several other conservation partners, is a reminder of modern Winnipeg's prairie roots. NCC's Yellow Quill Prairie Preserve is located 20 kilometres southeast of Brandon and two kilometres north of the junction of the Souris and Assiniboine rivers. It abuts the western boundary of the Canadian Forces Base Shilo training grounds and is immediately north of 800 acres (324 hectares) of the Assiniboine Corridor Wildlife Management Area. Before heading out the Yellow Quill Prairie Preserve, please contact NCC's Manitoba Region at 1-866-683-6934 to obtain prior permission and to coordinate your visit. 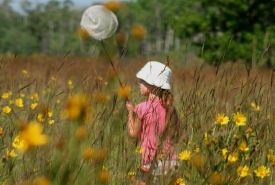 NCC established the Yellow Quill Prairie Preserve south of Brandon, Manitoba in 1998. The preserve offers species at risk in this area a better chance for survival and aims to maintain the last intact remnants of their natural habitats. A recent increase in cultivation and irrigation of native range in southwestern Manitoba has put new pressure on the few remnants of mixed grass prairie grasslands, which at one time covered thousands of square kilometres. Less than 10 per cent remains intact today. NCC attained a true treasure in May 2012 with the purchase of Fort Ellice: a 3,500-acre (1,416-hectare) property. Fort Ellice is a significant historical and natural site. Sandhill prairie, oak-aspen forest, mixed-grass prairie and aspen parkland exist in this unique landscape. 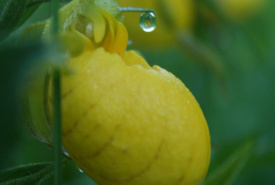 The area supports more than 160 species at risk and NCC continues to protect these habitats. NCC's Fort Ellice property is located on the west side of St. Lazare. Exit the town through Highway 41 and drive approximately one mile. There will be a a right-hand turn south onto a gravel road. Follow that road to Fort Ellice. Fort Ellice is positioned on Beaver Creek, near the confluence of the Assiniboine and Qu'Appelle Rivers, just east of the present-day Manitoba-Saskatchewan border. Before heading out to Fort Ellice, please contact the Manitoba Region at 1-866-683-6934 to obtain prior permission and to coordinate your visit. 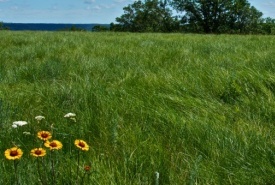 Stony Mountain Prairie Preserve is an eight-acre (three-hectare) property donated by the Regional Municipality of Rockwood. The preserve is located on the top of the Stony Mountain escarpment. It features a unique oasis of grasses and flowers common to the native tall grass and mixed grass prairies that used to cover the region. 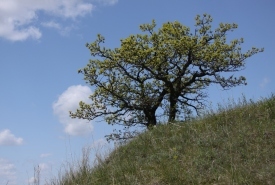 Stony Mountain Prairie Preserve is under the threat of leafy spurge — an agressive invasive weed species from Eurasia that has infested more than 5 million acres (2 million hectares) in the United States and the prairie provinces of Canada.